Thanksgiving is just around the corner! Can you believe it? This year has flown past! One of my favorite things about Thanksgiving is making fun, simple crafts to decorate. I’m definitely on a budget when it comes to decorating for the holidays, so I typically make my own DIY décor. This year I thought it would be fun to involve the kiddos in the decoration making process. So I’ve found tons of fun DIY decorations for fall that you can make with your kids! These crafts/decorations are simple and easy to make which is a must when you’re already busy getting ready for the holidays! So let’s get started! Here are my favorite DIY Thanksgiving decorations that you can make with your kids! This might be my favorite DIY Thanksgiving decoration. It’s so easy to make! And it will cost you less than $5! All you have to do is cover some artificial leaves with Elmer’s glue and then cover the leaves with glitter! After it dries you can punch a hole in each leaf so you can hang them around your home! I love these yarn pumpkins! They’re so cute and would be easy to make with your kids! All you need is orange yarn, Elmer’s glue, a balloon, and a green pipe cleaner! These felt pumpkins are adorable! This is a simple sewing project for teaching your kiddos how to sew. All you need is some orange and green felt, green and black string, and cotton balls. First, you’ll need to cut out two pumpkins shapes in your orange felt. I recommend printing a template from google, so that it’s exact. You can also cut a small green rectangle from the green felt for the stem. You can stitch in the eyes and mouth of the pumpkin, or you can draw them on with sharpie to make it simpler. Next, start sewing the two pieces of felt together! 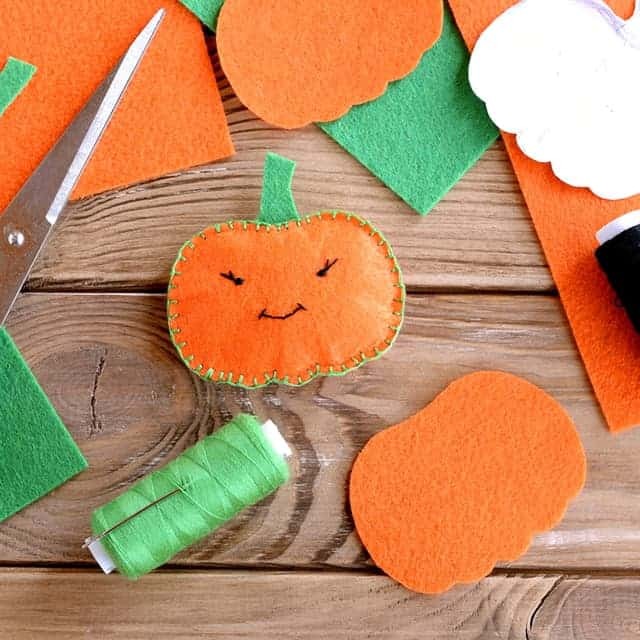 Remember when you reach the top of the pumpkin to put in your green rectangle for the stem and sew it in! Once there is only an inch of unsewn space left, stuff the pumpkin full of cotton balls. Then sew it up the rest of the way! Simple! This is a great beginners sewing project, and I think these pumpkins would look adorable in a fall wreath, or in a fall garland! This might be the simplest project on here! All you need is some orange felt, a pine cone, googly eyes, glue, and feathers. Cut the felt into a small triangle for the turkey’s beak. 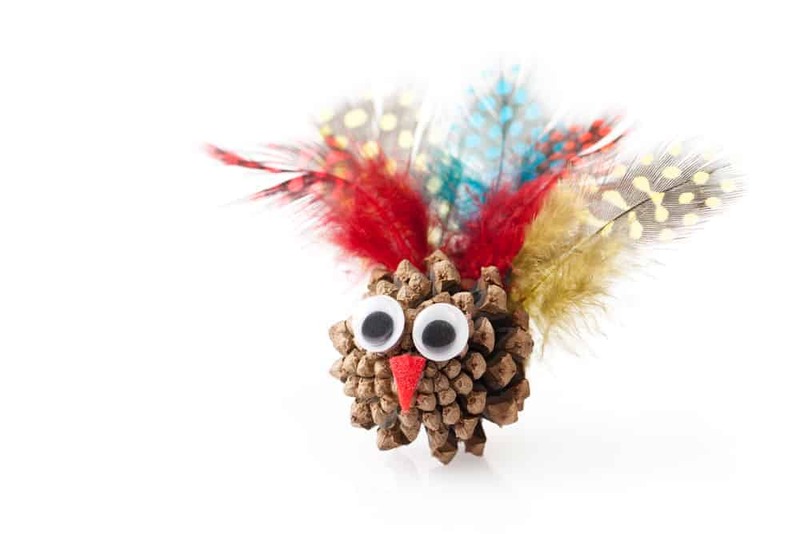 Glue the googly eyes and beak to the bottom of the pine cone and glue the feathers to the top! I love how simple, but cute this DIY decoration is. I love these glittery pumpkins! This DIY décor item is probably better for older children (it could get messy with little kids!) I love how simple and easy this project is and I think these glitter pumpkins would be the perfect addition to a mantle or dining room table! I love this cute DIY tree. I think it’s an adorable decoration that’s also great for getting your family thinking about what they’re grateful for! This easy decoration is perfect for kids and they’ll love being able to write down what they’re thankful for on the leaves of this tree! I love that not only is this a creative and fun centerpiece for Thanksgiving, but it is also perfect for displaying your fruit and cheese appetizers. This project is so simple, and your kids can help you put all of the fruit and cheese on to the skewers! These little Reese’s Pieces filled turkeys are so cute! They’re so easy to make and they would be fun for a classroom treat or for a fun treat for your Thanksgiving guests. These cute turkey’s are made from some card stock and Hershey Kisses! These would be a quick and easy craft your kids could make for their classmates or they would be a fun “appetizer/dessert” on Thanksgiving. These placemats are adorable! I think they would be absolutely perfect for the kids table at Thanksgiving dinner! Your kids will love that they got to put their handprint on the place mats and it’s a fun and easy project for you! I love this cute turkey candy bowl! It would be so easy to make and your kids will love getting to trace and cut out their hand prints for the turkeys feathers. This is perfect for displaying any yummy treats you have on Thanksgiving! I love this adorable magnet! Your kids will love getting to put the cute scarecrow face together. This would be a cute addition to any refrigerator or front door! 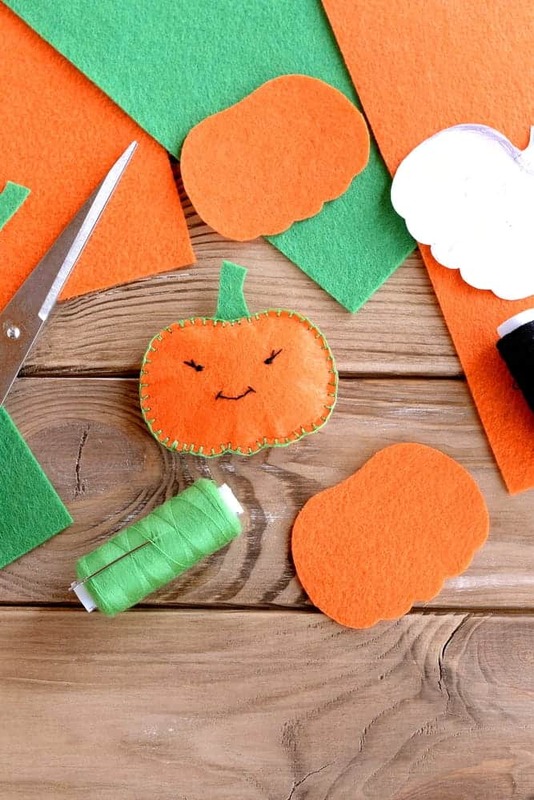 Which of these Thanksgiving crafts is your favorite? Let me know in the comments below.